Depending on your taste, the Zombies vs. Cheerleaders slot machine is up for debate. Those who enjoy graphic novels may appreciate the look of this game because the images look hand-drawn rather than computer animated. The theme makes the game somewhat entertaining, but overall this online slot doesn’t hit the mark. Who Will Win in the Zombies vs Cheerleaders Slot Machine? 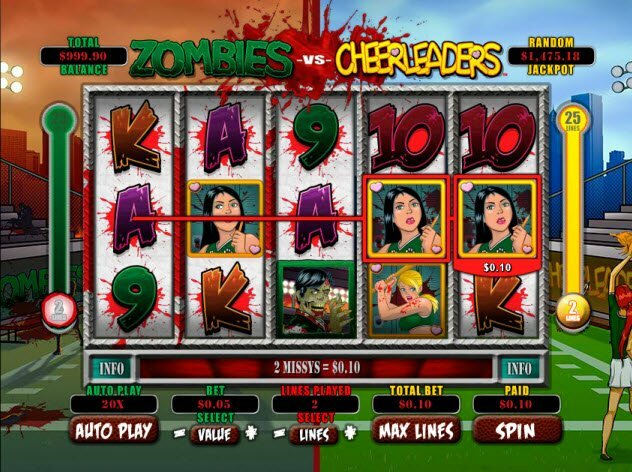 Powered OpenBet, The Zombies vs Cheerleaders slot machine contains 5 reels and 25 paylines. When it comes to anything associated with the horror genre, I’m usually a fan. That’s why Zombies vs Cheerleaders Slot seemed like a fool-proof guaranteed entertaining. Unfortunately, the game falls short of expectations with its mediocre graphics. In addition, the game takes a really long time to load. The concept might be cool, but the quality of the graphics falls short of expectations. If the game designers sought to recreate graphic novel style images, then I can understand why the graphics look more like drawings than computer animations. However, in comparison with other online video slots, especially those powered by the OpenBet gaming software, then I expect more. The animations generally fall flat and look outdated. 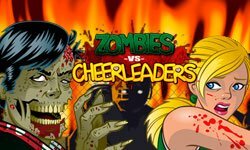 That being said, the game concept has a certain appeal by featuring a fight to the death between ferocious zombies and seemingly adorable cheerleaders. Zombies vs. Cheerleaders also features a soundtrack of heavy metal mixed with a Dubstep sound appropriate for the theme. The fight is on between the aggressive cheerleaders against the bloodthirsty undead. During the Battle Feature, players win 6 free games in which Cheerleader and Zombie Symbols turn into Wild Symbols, which substitute for all symbols except scatters. The fight is on between the aggressive cheerleaders against the bloodthirsty undead. 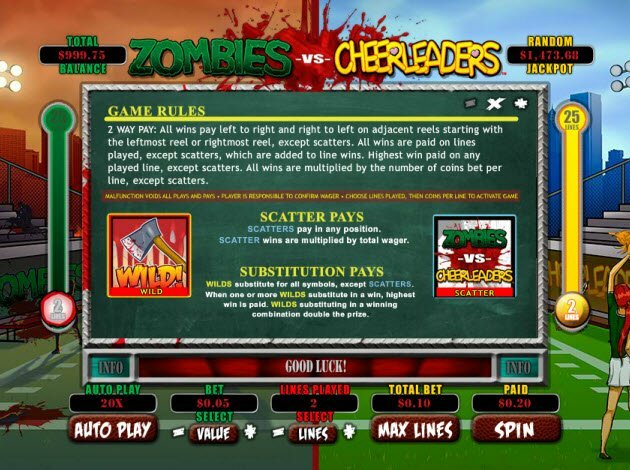 During the Zombie vs Cheerleaders Slot Bonus Battle Feature, players win 6 free games in which Cheerleader and Zombie Symbols turn into Wild Symbols, which substitute for all symbols except scatters. The Battle Feature starts whenever 3, 4, or 5 scatter symbols appear on reels. One aspect of this game that’s very unusual (with the exception of the walking dead, of course) is that all wins pay left to right as well as right to left on adjacent tiles. Usually online slot wins pay only from the left to the right, so this game rule definitely increases chances of winning. The Zombies vs. Cheerleaders video slot also contains Scatter Pays in which Scatter symbols pay in any position and wins are multiplied by total wagers. The Bloody Ax represents the Wild Symbol, which substitutes for all symbols except scatters.